Primavera Residences, the first eco-friendly condo complex in Cagayan de Oro, will host a celebratory dinner on June 28, 6 p.m., at its function hall, in appreciation of the city and stakeholders’ continued support for its projects and shared vision on sustainability. Italpinas Euroasian Design and Eco-Development Corp. (ITPI), the developer of Primavera Residences, has been receiving strong support from the local government and its stakeholders. The company considers CdO as well as its stakeholders as partners and strong allies in their advocacy on sustainability and the environment. 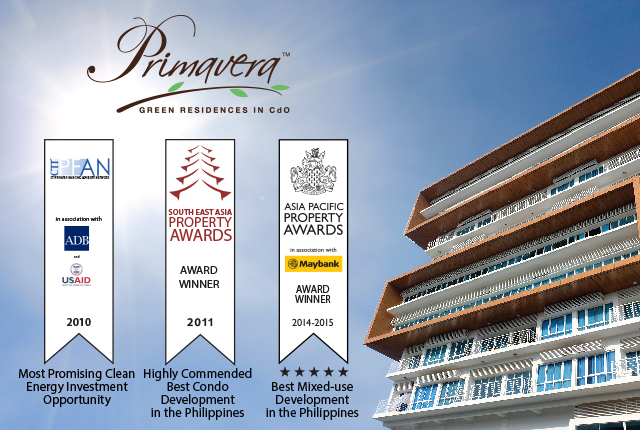 Primavera Residences has recently been accorded the Best Mixed-Use Development in the Philippines award in the 2014-2015 Asia Pacific Property Summit organized by the prestigious International Property Awards, and given in Kuala Lumpur, Malaysia. The International Property Awards is a global organization that recognizes excellence in property development around the world. ITPI chairman Jose P. Leviste, Jr. added that the award does not only help strengthen the company’s partnership with business organizations and financial institutions but also boost Cagayan de Oro’s position as an “emerging city of tomorrow” as declared recently by the UN Habitat. “We want to share our victory with them because we believe they are an integral part of our success. Together, we can work hand-in-hand to help make the city of Cagayan de Oro an economic hub in Northern Mindanao,” Leviste, Jr. said. He accepted the award in Kuala Lumpur on behalf of ITPI. ITPI president Atty. Jojo Leviste, III, on the other hand, noted that the company’s goal to be recognized as the industry leader in sustainable architecture and design is soon being realized, with the recognition it is getting. “Our vision and mission is to make the country a greener place to live in, and we are pleased that our Cagayan de Oro project is getting that attention,” Leviste III said. The celebration dinner will fete representatives from the Cagayan de Oro local government, as well as Primavera Residences’ bank partners, brokers and agents, representatives from the media, and other stakeholders. Primavera Residences is a twin-tower, 10-storey mixed-use development located in Uptown Cagayan de Oro. It offers residential, commercial and office spaces for lease and purchase. All units at Tower 1 are ready for occupancy. In 2011, the property has been highly commended by the Southeast Asia Property Awards (SEAPA) as Best Condo Development in the Philippines. For any inquiries about events at Primavera Residences, visit the website at www.primaveraresidences.com or call (088) 310-8173, 0917-7921078.